Lipomas are the most common soft-tissue tumor. These slow-growing, benign fatty tumors form soft, lobulated masses enclosed by a thin, fibrous capsule. Although it has been hypothesized that lipomas may rarely undergo sarcomatous change, this event has never been convincingly documented. It is more probable that lipomas are at the benign end of the spectrum of tumors, which, at the malignant end, include liposarcomas (see Pathophysiology). Because more than half of lipomas encountered by clinicians are subcutaneous in location, most of this article will be devoted to that subgroup. Additional information about other locations (eg, intramuscular, retroperitoneal, gastrointestinal [GI]) will be included as appropriate. Lipomas are common benign mesenchymal tumors. They may develop in virtually all organs throughout the body. The anatomy depends on the tumor site. Subcutaneous lipomas are usually not fixed to the underlying fascia. The fibrous capsule must be removed to prevent recurrence. In the GI tract, lipomas present as submucosal fatty tumors. The most common locations include the esophagus, stomach, and small intestine. Symptoms occur from luminal obstruction or bleeding. Duodenal lipomas are mostly small but may become pedunculated with obstruction of the lumen. They may cause pain, obstructive jaundice, or intussusception in younger patients. Mucosal erosion over the lipoma may lead to severe bleeding (see the image below). Small intestinal lipomas occur mainly in elderly patients. They tend to be pedunculated submucosal lesions. They are more common in the ileum than in the duodenum or jejunum. As with duodenal lipomas, severe hemorrhage or intussusception may occur. Upper gastrointestinal series shows duodenal lipoma with central ulceration where the overlying mucosa has thinned, ulcerated, and bled. Colonic lipomas are usually discovered on endoscopy. Gentle palpation with a biopsy forceps reveals the soft nature of the submucosal mass. A biopsy specimen of the mucosa may reveal underlying fat, the so-called naked fat sign. As with lipomas in other locations, colonic lipomas may cause pain with obstruction or intussusception. As noted above, a fatty protrusion of preperitoneal fat termed a "lipoma of the spermatic cord" is a common finding on groin exploration for hernia repair. Numerous case reports document the presence of lipomas in other, rare locations, with these tumors having been found virtually everywhere in the body. [2, 3, 4, 5, 6] Lipomatous involvement of endocrine organs, including the thyroid, adrenal glands, pancreas, and parathyroid glands, has been described. Maxillofacial lipomas, including intralingual, parotid, orbitonasal, maxillary sinusoidal, and parapharyngeal space masses, have also been documented. Mixed histologies, such as angiolipomas and fibrolipomas, are often encountered and are usually benign. Differentiation from liposarcoma may be difficult. Other fatty tumors include lipoblastomas, hibernomas, atypical lipomatous tumors, and liposarcomas. Lipoblastomas occur almost exclusively in infants and children. They have a benign clinical course and a low recurrence rate after surgical excision. Hibernomas, also rare, derive their name from the morphologic resemblance to the brown fat of hibernating animals. They presumably arise from fat that may occur in the back, hips, or neck in adults and infants. Atypical lipomatous tumors are generally considered to be low-grade sarcomas, with a strong propensity to recurrence but little metastatic potential. Liposarcomas are true mesenchymal malignancies. Speculation exists regarding a potential link between trauma and subsequent lipoma formation. One theory suggests that trauma-related fat herniation through tissue planes creates so-called pseudolipomas. It has also been suggested that trauma-induced cytokine release triggers pre-adipocyte differentiation and maturation. To date, no definitive link between trauma and lipoma formation has been prospectively demonstrated. Lipomas occur in 1% of the population. Most of these are small subcutaneous tumors that are removed for cosmetic reasons. These subcutaneous lipomas will be considered separately from lipomas in other locations in the discussion below. In the intestine, lipomas constitute 16% of benign, small neoplasms; this percentage is lower than that of leiomyomas (18%) and higher than that of adenomas (14%). The outcome and prognosis are excellent for benign lipomas. 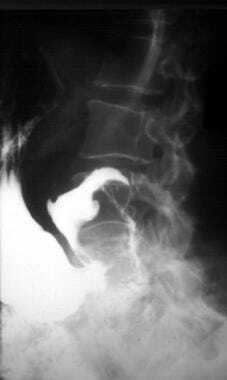 Recurrence is uncommon but may develop if the excision was incomplete. Chiang JM, Lin YS. Tumor spectrum of adult intussusception. J Surg Oncol. 2008 Nov 1. 98(6):444-7. [Medline]. Sakurai H, Kaji M, Yamazaki K, et al. Intrathoracic lipomas: their clinicopathological behaviors are not as straightforward as expected. Ann Thorac Surg. 2008 Jul. 86(1):261-5. [Medline]. Erdem HR, Nacir B, Ozeri Z, Karagöz A. [Episacral lipoma: a treatable cause of low back pain]. Agri. 2013 Apr. 25(2):83-6. [Medline]. Lee HK, Hwang SB, Chung GH, Hong KH, Jang KY. Retropharyngeal spindle cell/pleomorphic lipoma. Korean J Radiol. 2013 May. 14(3):493-6. [Medline]. [Full Text]. Jain P, Chakrabarty B, Kumar A, Gupta N, Kabra M, Gulati S. Encephalocraniocutaneous lipomatosis with neurocutaneous melanosis. J Child Neurol. 2014 Jun. 29 (6):846-9. [Medline]. Choi JW, Kim HJ, Kim J, Kim HJ, Cha JH, Kim ST. Spindle cell lipoma of the head and neck: CT and MR imaging findings. Neuroradiology. 2013 Jan. 55(1):101-6. [Medline]. Koyanagi I, Hida K, Iwasaki Y, et al. Radiological findings and clinical course of conus lipoma: implications for surgical treatment. Neurosurgery. 2008 Sep. 63(3):546-51; discussion 551-2. [Medline]. Gourineni P, Dias L, Blanco R, et al. Orthopaedic deformities associated with lumbosacral spinal lipomas. J Pediatr Orthop. 2009 Dec. 29(8):932-6. [Medline]. Signorini M, Campiglio GL. Posttraumatic lipomas: where do they really come from?. Plast Reconstr Surg. 1998 Mar. 101(3):699-705. [Medline]. Italiano A, Ebran N, Attias R, et al. NFIB rearrangement in superficial, retroperitoneal, and colonic lipomas with aberrations involving chromosome band 9p22. Genes Chromosomes Cancer. 2008 Nov. 47(11):971-7. [Medline]. [Full Text]. Pang D, Zovickian J, Oviedo A. Long-term outcome of total and near-total resection of spinal cord lipomas and radical reconstruction of the neural placode, part II: outcome analysis and preoperative profiling. Neurosurgery. 2010 Feb. 66(2):253-72; discussion 272-3. [Medline]. Pang D, Zovickian J, Oviedo A. Long-term outcome of total and near-total resection of spinal cord lipomas and radical reconstruction of the neural placode: part I-surgical technique. Neurosurgery. 2009 Sep. 65(3):511-28; discussion 528-9. [Medline]. Yoshiyama A, Morii T, Tajima T, Aoyagi T, Honya K, Mochizuki K, et al. D-dimer levels in the differential diagnosis between lipoma and well-differentiated liposarcoma. Anticancer Res. 2014 Sep. 34 (9):5181-5. [Medline]. Einarsdottir H, Soderlund V, Larsson O. 110 subfascial lipomatous tumors. MR and CT findings versus histopathological diagnosis and cytogenetic analysis. Acta Radiol. 1999 Nov. 40(6):603-9. [Medline]. Hung EH, Griffith JF, Ng AW, Lee RK, Lau DT, Leung JC. Ultrasound of musculoskeletal soft-tissue tumors superficial to the investing fascia. AJR Am J Roentgenol. 2014 Jun. 202 (6):W532-40. [Medline]. Bakshi R, Shaikh ZA, Kamran S. MRI findings in 32 consecutive lipomas using conventional and advanced sequences. J Neuroimaging. 1999 Jul. 9(3):134-40. [Medline]. Matsumoto K, Hukuda S, Ishizawa M. MRI findings in intramuscular lipomas. Skeletal Radiol. 1999 Mar. 28(3):145-52. [Medline]. Reiseter T, Nordshus T, Borthne A. Lipoblastoma: MRI appearances of a rare paediatric soft tissue tumour. Pediatr Radiol. 1999 Jul. 29(7):542-5. [Medline]. Lee TJ, Collins J. MR imaging evaluation of disorders of the chest wall. Magn Reson Imaging Clin N Am. 2008 May. 16(2):355-79, x. [Medline]. Einarsdottir H, Soderlund V, Larson O. MR imaging of lipoma and liposarcoma. Acta Radiol. 1999 Jan. 40(1):64-8. [Medline]. Thornhill RE, Golfam M, Sheikh A, Cron GO, White EA, Werier J, et al. Differentiation of lipoma from liposarcoma on MRI using texture and shape analysis. Acad Radiol. 2014 Sep. 21 (9):1185-94. [Medline]. Araki Y, Isomoto H, Tsuji Y. Endoscopic removal with clipping for colonic lipomas. Kurume Med J. 1998. 45(4):341-3. [Medline]. Al Absi E, Karim T, Colterjohn N, et al. A novel surgical approach to lipomatous tumours of the deltoid region. Sarcoma. 2010. 2010:495834. [Medline]. [Full Text]. Goldman A, Wollina U. Lipoma treatment with a subdermal Nd:YAG laser technique. Int J Dermatol. 2009 Nov. 48(11):1228-32. [Medline]. Al-basti HA, El-Khatib HA. The use of suction-assisted surgical extraction of moderate and large lipomas: long-term follow-up. Aesthetic Plast Surg. 2002 Mar-Apr. 26(2):114-7. [Medline]. Berenguer B, de la Cruz L, de la Plaza R. Liposuction in atypical cases. Aesthetic Plast Surg. 2000 Jan-Feb. 24(1):13-21. [Medline]. Ilhan H, Tokar B. Liposuction of a pediatric giant superficial lipoma. J Pediatr Surg. 2002 May. 37(5):796-8. [Medline]. Wilhelmi BJ, Blackwell SJ, Mancoll JS. Another indication for liposuction: small facial lipomas. Plast Reconstr Surg. 1999 Jun. 103(7):1864-7. [Medline]. Saray A, Ocal K, Berberoglu M, et al. Endoscopic balloon dissection for removal of lipomas via transaxillary route. Aesthetic Plast Surg. 2001 Nov-Dec. 25(6):463-7. [Medline]. Abner ML. Lipoma of the abdomen after suction lipectomy. Plast Reconstr Surg. 2001 Jan. 107(1):293. [Medline]. Oliveira AM, Nascimento AG, Lloyd RV. Leptin and leptin receptor mRNA are widely expressed in tumors of adipocytic differentiation. Mod Pathol. 2001 Jun. 14(6):549-55. [Medline]. [Full Text]. Alberti D, Grazioli L, Orizio P. Asymptomatic giant gastric lipoma: what to do?. Am J Gastroenterol. 1999 Dec. 94(12):3634-7. [Medline]. Azumi N, Curtis J, Kempson RL, et al. Atypical and malignant neoplasms showing lipomatous differentiation. A study of 111 cases. Am J Surg Pathol. 1987 Mar. 11(3):161-83. [Medline]. Bassett MD, Schuetze SM, Disteche C, et al. Deep-seated, well differentiated lipomatous tumors of the chest wall and extremities: the role of cytogenetics in classification and prognostication. Cancer. 2005 Jan 15. 103(2):409-16. [Medline]. [Full Text]. Buttner A. Lipoma of the adrenal gland. Pathol Int. 1999 Nov. 49(11):1007-9. [Medline]. Carilli S, Alper A, Emre A. Inguinal cord lipomas. Hernia. 2004 Aug. 8(3):252-4. [Medline]. Corbi P, Boufi M, Thierry G. Giant pleural lipoma. Eur J Cardiothorac Surg. 1999 Aug. 16(2):249-50. [Medline]. [Full Text]. Cribb GL, Cool WP, Ford DJ, Mangham DC. Giant lipomatous tumours of the hand and forearm. J Hand Surg Br. 2005 Oct. 30 (5):509-12. [Medline]. Einarsdottir H, Skoog L, Soderlund V, et al. Accuracy of cytology for diagnosis of lipomatous tumors: comparison with magnetic resonance and computed tomography findings in 175 cases. Acta Radiol. 2004 Dec. 45(8):840-6. [Medline]. Fernandez-Flores A, Juanes F. Value of cytological imprints in the diagnosis of atypical lipomatous tumor. Diagn Cytopathol. 2005 Jan. 32(1):51-2. [Medline]. Fukushima KK, Mitani T, Hashimoto K. Ventricular tachycardia in a patient with cardiac lipoma. J Cardiovasc Electrophysiol. 1999 Aug. 10(8):1161. [Medline]. Furlong MA, Fanburg-Smith JC, Miettinen M. The morphologic spectrum of hibernoma: a clinicopathologic study of 170 cases. Am J Surg Pathol. 2001 Jun. 25(6):809-14. [Medline]. Gersin KS, Heniford BT, Garcia-Ruiz A. Missed lipoma of the spermatic cord. A pitfall of transabdominal preperitoneal laparoscopic hernia repair. Surg Endosc. 1999 Jun. 13(6):585-7. [Medline]. Hizawa K, Kawasaki M, Kouzuki T. Unroofing technique for the endoscopic resection of a large duodenal lipoma. Gastrointest Endosc. 1999 Mar. 49(3 Pt 1):391-2. [Medline]. Kamiyoshihara M, Kawashima O, Ishikawa S. [Retroperitoneal lipoma through the foramen of Bochdalek detected as a mass of chest roentgenogram: report of a case]. Kyobu Geka. 1999 Dec. 52(13):1141-3. [Medline]. Kaniklides C, Frykberg T, Lundkvist K. Paediatric mesenteric lipoma, an unusual cause of repeated abdominal pain. A case report. Acta Radiol. 1998 Nov. 39(6):695-7. [Medline]. Kooby DA, Antonescu CR, Brennan MF, et al. Atypical lipomatous tumor/well-differentiated liposarcoma of the extremity and trunk wall: importance of histological subtype with treatment recommendations. Ann Surg Oncol. 2004 Jan. 11(1):78-84. [Medline]. Lam KY, Lo CY. Teratoma in the region of adrenal gland: a unique entity masquerading as lipomatous adrenal tumor. Surgery. 1999 Jul. 126(1):90-4. [Medline]. Nilsson M, Domanski H, Mertens F, et al. Atypical lipomatous tumor with rare structural rearrangements involving chromosomes 8 and 12. Oncol Rep. 2005 Apr. 13(4):649-52. [Medline]. Ogilvie CM, Torbert JT, Hosalkar HS, et al. Recurrence and bleeding in hibernomas. Clin Orthop Relat Res. 2005 Sep. 438:137-43. [Medline]. Pereira JA, Schonauer F. Lipoma extraction via small remote incisions. Br J Plast Surg. 2001 Jan. 54(1):25-7. [Medline]. Raju GS, Gomez G. Endoloop ligation of a large colonic lipoma: a novel technique. Gastrointest Endosc. 2005 Dec. 62(6):988-90. [Medline]. Raymond GS, Barrie JR. Endobronchial lipoma: helical CT diagnosis. AJR Am J Roentgenol. 1999 Dec. 173(6):1716. [Medline]. Salasche SJ, McCollough ML, Angeloni VL. Frontalis-associated lipoma of the forehead. J Am Acad Dermatol. 1989 Mar. 20(3):462-8. [Medline]. Samad L, Ali M, Ramzi H. Respiratory distress in a child caused by lipoma of the esophagus. J Pediatr Surg. 1999 Oct. 34(10):1537-8. [Medline]. Sarioglu AC, Kaynar MY, Hanci M. Sylvian fissure lipomas: case reports and review of the literature. Br J Neurosurg. 1999 Aug. 13(4):386-8. [Medline]. Skubitz KM, Cheng EY, Clohisy DR, et al. Differential gene expression in liposarcoma, lipoma, and adipose tissue. Cancer Invest. 2005. 23(2):105-18. [Medline]. Sommerville SM, Patton JT, Luscombe JC, et al. Clinical outcomes of deep atypical lipomas (well-differentiated lipoma-like liposarcomas) of the extremities. ANZ J Surg. 2005 Sep. 75(9):803-6. [Medline]. Trabut JB, Duong Van Huyen JP, Artru B. [Intravascular lipoma of the superior vena cava]. Ann Pathol. 1999 Dec. 19(6):529-31. [Medline]. van Heel DA, Panos MZ. Colonoscopic appearances and diagnosis of intussusception due to large bowel lipoma. Endoscopy. 1999 Aug. 31(6):508. [Medline]. Weiss SW. Lipomatous tumors. Monogr Pathol. 1996. 38:207-39. [Medline]. Duodenal lipoma resected through a duodenotomy. Overlying mucosa with central ulceration removed and lobulated fatty tumor shelled out intact with capsule. The mucosa was then sutured closed, and the duodenotomy closed. The stitch was placed to orient the specimen for pathologic examination.